When it comes to listening to portable music, I love my V-Moda REVAMP True Blood earbuds. Not only do they give me big sound, but the silver bullet pendant is pretty cool, too. Having said that, I’m also a big fan of more traditional headphones. I prefer the cushy feel on my ears (when I’m not concerned about getting headphone hair), and I like the grand concert sound I get from them as well. 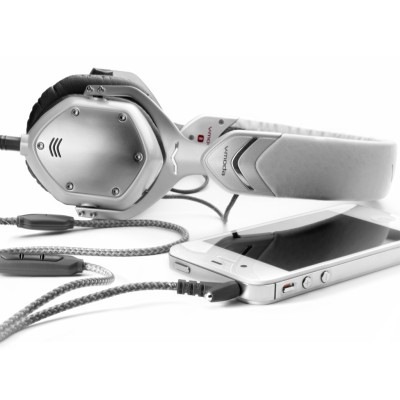 So, when my basic headphones take a header, sign me up for these beauties — Crossfade M-80 White Pearl by V-Moda. Boosted with lightweight, steel construction and an ergonomic Steelflex headband. I don’t usually think about whether headphones are good looking or not, but these come in white with plenty of silver accents and were designed with fashion in mind, not to mention all of those shiny white-and-silver Apple products. While pretty is fine, it’s performance that counts when it comes to headphones. The M-80 is designed to give the wearer a balanced sound comparable to vinyl while plugged into smart phones, any tablet or notebook. For specs, check out the V-Moda website. They retail for $230, but take a look over at amazon and you’ll spot them for $199.99.